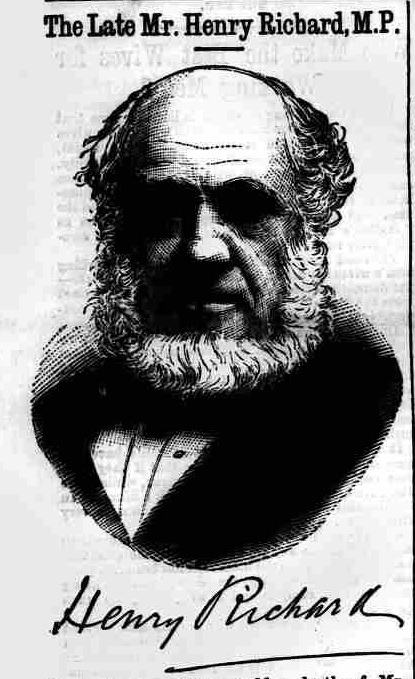 The deceased, who was his seventy-sixth year….had been in failing health for some time.… For the past two years he had been subject to angina pectoris, and had been cautioned against undue excitement. Since the rising of Parliament he and Mrs. Richard had been staying with Mr. Davies —Mr. Colman, M.P. for Norwich, being among the guests. On Monday night there was dinner party at Treborth, during which Mr. Richard appeared to be in his usual health, but shortly afterwards he complained of faintness, and Mrs. Richard was summoned. At eleven o’clock the deceased retired to bed. Dr. J. Roberts, Menai Bridge, and Dr. Richards, of Bangor, were sent for. Shortly before their arrival, however, he said that he felt very ill, and turned over and expired. The doctors certified as to the cause of death, and so an inquest was not necessary. Mr Henry Richard resided at 22, Bolton Gardens, South Kensington, one of the quiet aristocratic-looking buildings typical of the locality, and here since last Wednesday his body has reposed. It was cased in a leaden shell, which was enclosed in a massive oak coffin, with ornate brass mountings. A large burnished plate, topped by a perforated cross, bears the plain inscription ‘HENRY RICHARD. Born April 3rd, 1812. Died August 20tb, 1888.’ The coffin was placed in the library, where its presence was a mournful commentary on the shelves of standard books and works of reference, which showed signs of the care and attention bestowed on them during his lifetime by their gifted and cultured owner. Piled high over the bier, and littered over the purple pall, which fell in graceful folds from the head of the coffin, were a very large number of wreaths and other floral tributes of affection for and respect to the memory of the deceased gentleman. These were beautiful in the extreme. The Carnarvon Reform Club sent what must be regarded as the largest and most varied wreath. 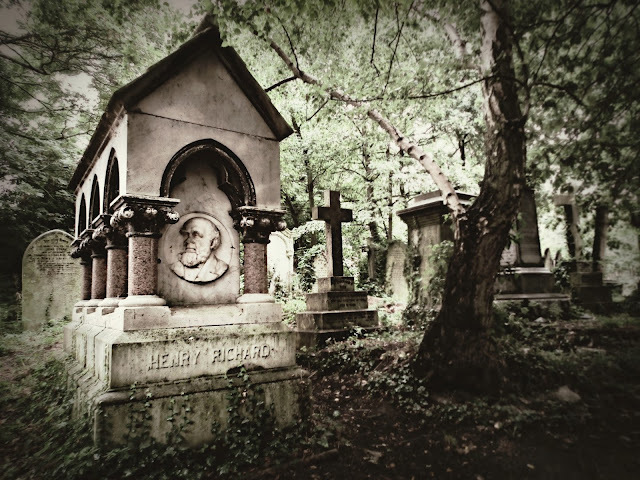 A more beautiful spot than Abney Park Cemetery could hardly be found in London, for the wealth of foliage and the neatly kept flower beds formed over and around the graves contrast with much effect with the handsome and costly monuments which deck the undulating slopes. Some of these are veritable works of art, containing statuary and other pieces of sculpture of great merit. Indeed the whole appearance of this burial ground is very suggestive of a French cemetery, notably Pere le Chaise, in Paris where sedulous attention to and lavish expenditure upon the graves and tombs of departed friends is held to be of great importance, a duty imposed upon the living which by no means must be neglected… Close to the south gate of the cemetery, in the shade of some fine chestnut and yew trees, was the spot selected for the final resting-place of the departed Welsh patriot. On all sides are lying famous and well known men connected with the Congregationalist communion. Brilliant divines and prosperous laymen, members of Parliament and gifted professional men—they are all gathered in one sad and solemn brotherhood of the grave. A strong posse of police from the 18N division under the command of Inspector Holland and Sargeant Trudgett, preserved order with ease and facility , and without their services the crowd of sightseers who had collected in Church-road North could not have been restrained from filling the seats in the church or unduly pressing round the grave. Punctual to the appointed hour, the hearse and mourning coaches arrived, and the coffin, which was quite covered with the wealth of wreaths and andother flowers, was carried into the church by six bearers and placed on a large catafalque, covered with a purple cloth, which was erected in front of the lofty reading desk. The relatives of the deceased followed. 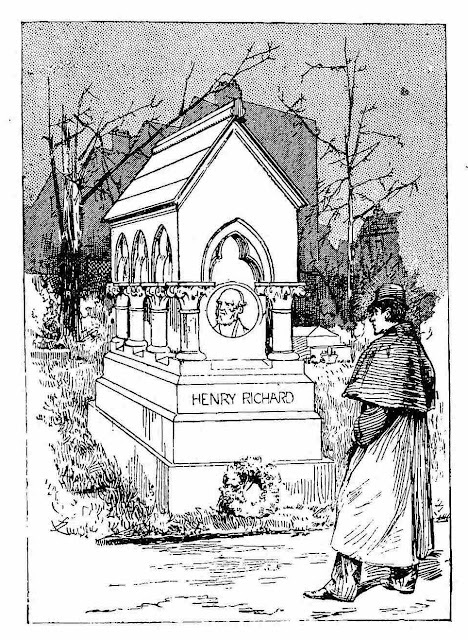 Succeeding them came representatives of the political associations and educational and other bodies with which Mr Heenry Richard was identified so prominently during life but as no regular procession was formed those present simply congregated inside the Church. Inside the chapel the scene was very awe-inspiring and, at the same time consolatory. It was something to have lived a life which was an example of the truism that “Virtue alone outbuilds the Pyramids”…. Through the stained-glass windows of the church came a soft, mellow light which toned down the sombre effect of the funeral garments of the congregation and made golden and crimson and blue diamond shaped patches on the walls and pavement. Henry Richard’s Portland stone and pink granite memorial was paid for by public subscription and designed by Mr E.J. 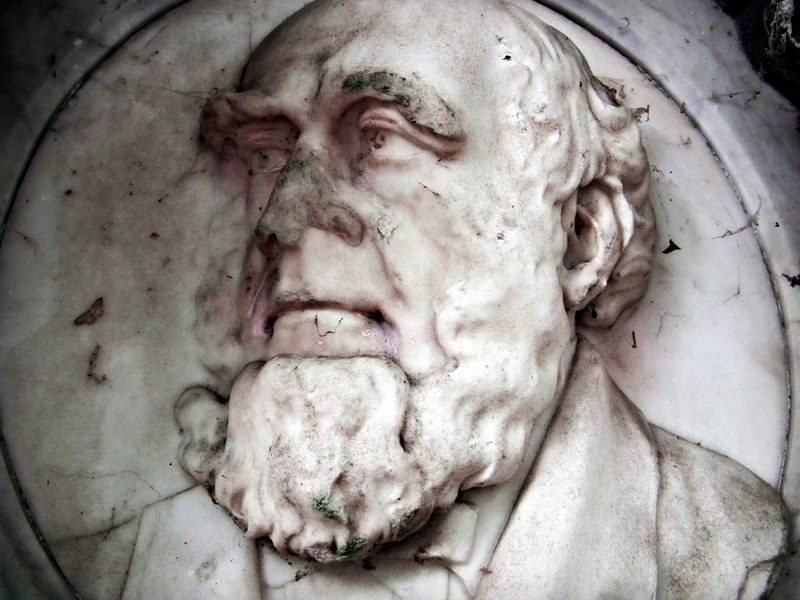 Physick who also carved the marble medallion attached to the front elevation. The ceremony for the unveiling in November 1889 was attended, according to the Graphic, by about 1000 people.